On Yemen, US "Isolated" in Endorsing GCC Immunity Deal Karman Opposes? UNITED NATIONS, October 18 -- As a draft resolution onYemen is negotiated among the UN Security Council's five permanent members the United States is "isolated," sources tell Inner City Press, is asking for an unequivocal "endorsement" of the Gulf Cooperation Council plan with its immunity for Ali Abdullah Saleh. Not only the UK and France but also Russia and China, the sources say, favor language calling for a political deal "based on" the GCC initiative. "It's a rare four on one split against the US," a well placed source tells Inner City Press. This source says lead US Ambassador Susan Rice is not the one doing the negotiating, but "of course the orders come from Washington." 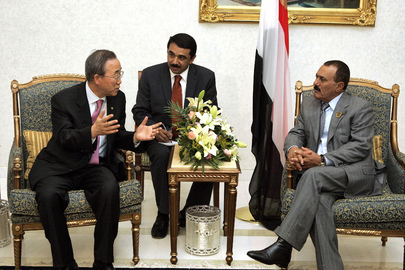 The GCC deal, with its full immunity not only for Saleh but also his associates, was largely the work of the US. But complaints have been made in the consultations that the Council members have not ever seen the GCC proposal in writing, nor been briefed about it. Meanwhile the Yemeni Nobel Peace Prize winner Tawakkul Karman has written to Ban Ki-moon urging the UN to "hold the perpetrators accountable" -- precisely what the GCC initiative does not do. Inner City Press has learned and confirmed that Tawakkul Karman is coming to New York. One hopes that her views on accountability are heard by the Permanent Five -- or "Permanent One," as a source bitterly put it -- before the Yemen draft resolution is circulated or adopted. Watch this site. Footnote: Tawakkul Karman has been among those camped out in Sanaa's Change Square amid the crackdowns. With a meeting anticipated between Karman and Ban Ki-moon (whose only Tuesday appointment listed so far is with "William Harwood, former Peace Corps Volunteer of Korea"), Inner City Press on Monday asked Ban's spokesman Martin Nesirky if Ban believed that the Occupy Wall Street protesters should be allowed to remain in Zuccotti Park, 80 blocks south of the UN. Ban's spokesman Nesirky said, "obviously, law and order and other matters are really the domain of sovereign States, sovereign Governments." What will Ban tell Tawakkul Karman? Watch this site.